Ferrari In Art. A celebration of the legend by Paul Chenard. You can feel the love for his work in all the small details. 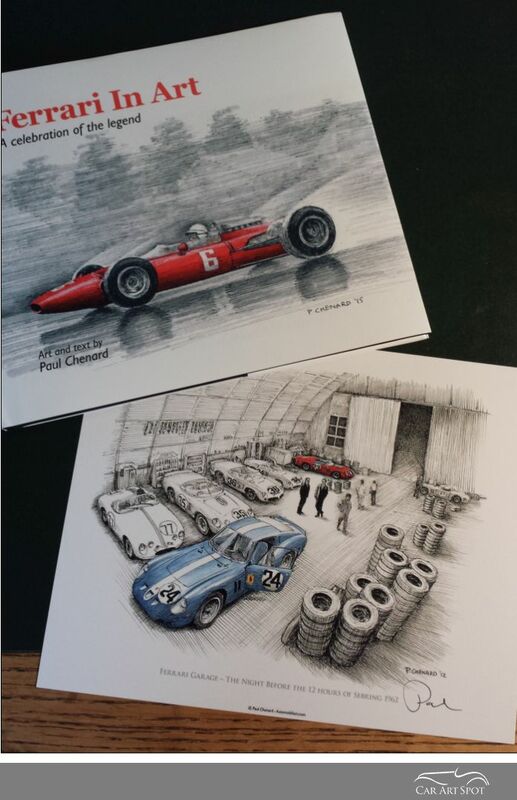 Artist Paul Chenard might be best known for his fast sketches of classic cars. At many car events in the UK or Canada you will find him sitting somewhere in a corner sketching another beauty. Passers by often stop to see what he is creating and share the admiration for the car and his wonderful skills. Paul has a professional background as a graphic designer but his passion is creating art and writing about the history of automobile racing. 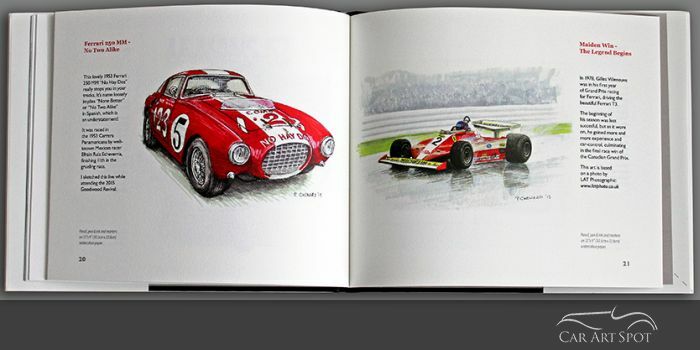 In his new self-published book “Ferrari in Art – A celebration of the legend”, he shares a fine collection of his work. Each drawing comes with some background information about the race. His graphic roots certainly show off in this well designed little book. You can feel the love for his work in all the small details. From the image hand-glued on the hardcover to the choice of high quality paper and font types. All the details have been perfected. And the nice deal is that this book comes with an optional small poster of your choice. My favourite is the poster of the “Ferrari Garage – The Night before the 12 hours of Sebring 1962”. This is the sketch of the scene with two cars highlighted in blue and red. Paul did me a big favour by signing the poster and the book. Make sure you get your personal copy soon because his previous book sold out quickly and has already become a collectors item. The format is a 28-page 9.75”x 8.25” hardcover book with slipcover. 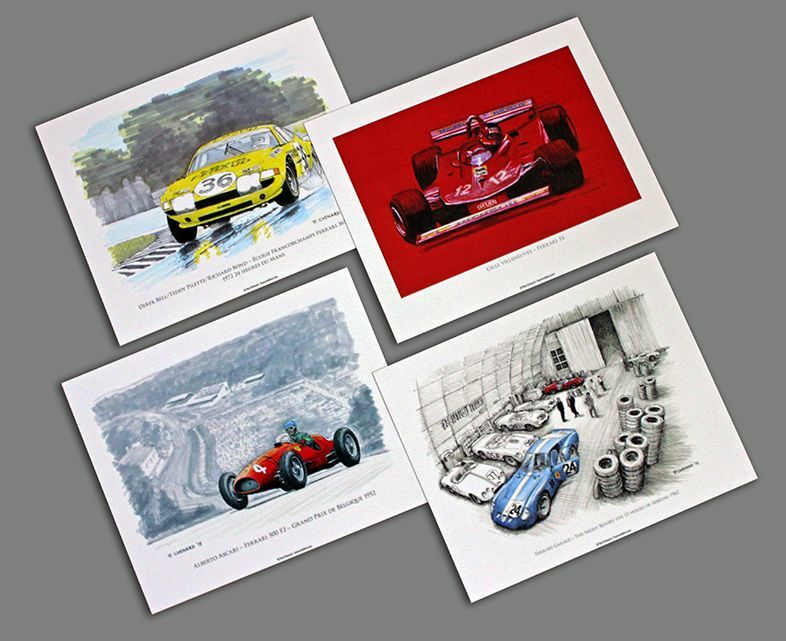 When book buyers request their Ferrari poster, Paul also includes a book-cover label and bookplate as added free gifts.